Curious about Bluegrass Music? Here&apos;s some information to put you in a Bluegrass state of mind. The grass. The state. The region. The music. If you are planning a visit to Central Kentucky, you&apos;ve probably already discovered that the term Bluegrass is liberally applied to subjects that at first may seem dissimilar. If it&apos;s Bluegrass music that strikes a chord with you, read on to learn about our state&apos;s connection to this unique genre of American music. We&apos;ll start by explaining how a grass becomes a musical style. Bluegrass is believed to have been brought to the U.S. by early settlers. Also known as smooth meadow-grass, or common meadow-grass, it is an excellent grass for grazing livestock. The seeds can withstand harsh weather conditions and would have been a good choice for pioneers traveling to build a new life in uncertain conditions. This type of perennial grass grows especially well in Kentucky&apos;s limestone soil, and quickly established itself. Though certainly not "blue" in color, Poa Pratensis, when allowed to grow to its full height, does form blue flower heads. The rich deep green color of this grass can appear to have a blueish hue when compared to other grasses. With a global reputation for scenic beauty, the varied landscape of Kentucky ranges from the "land of lakes" in the west to the Appalachian mountains in the east. In between are our famous gently rolling hills of Bluegrass pasture land. So renowned are these lush and fertile pastures that the entire state is referred to as the Bluegrass State. The area of central Kentucky known as the Bluegrass Region is only 1/5 of the area of the state. 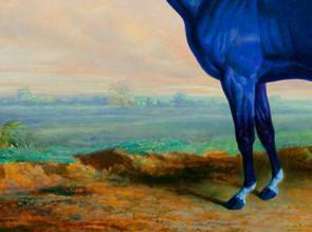 Anchored by the second largest city in the state, Lexington, this region gave rise to the state&apos;s two signature industries: the horse industry and the bourbon industry. Geologically and ecologically distinct from the rest of the state, it is the image of this iconic region that captivates so many people around the world. Bluegrass Note: The Festival of the Bluegrass is a traditional Bluegrass music festival held at Lexington&apos;s Kentucky Horse Park in June. Established in 1974, every festival features nationally and internationally known acts, plus a camp for youngsters ages 8 to 18 with an interest in Bluegrass music. While the grass is believed to be an introduced species, probably brought over from Europe or Africa, the music was born of this land. And while the grass has found its way to much of the United States and Canada, Bluegrass music reaches even further. In the 1940s, Kentuckian Bill Monroe created a sound so distinct from other "country" music that it was given its own name: Bluegrass, after the name of his band "The Blue Grass Boys." Nearly 75 years later, this Kentucky product, like our horses and our Bourbon, has garnered fans around the globe. You know it when you hear it, don&apos;t you? Your foot starts tapping while a string band plays a lively rhythm. Singers move to the mic to produce high-pitched harmonies and then take turns showing off on their chosen instrument. But even Bluegrass musicians don&apos;t always agree on what Bluegrass music "is", though it doesn&apos;t take them long at all to decide in which key to play it! Even the International Bluegrass Music Association forgoes offering a definition on their otherwise extensive website. No one disputes that the sound originated with Bill Monroe and his Blue Grass Boys. Most agree that the sound of classic Bluegrass music solidified when Earl Scruggs joined the band and brought with him his distinctive three-finger picking style on the banjo. In 1948 he left to form his own group, Flatt & Scruggs, the second most important band in the development of the genre. Bluegrass Note: Owensboro, in western Kentucky, is home to the International Bluegrass Music Center and Museum, dedicated to preservation and innovation in bluegrass music. (270) 926-7891. Just 45 minutes south of Owensboro you&apos;ll find the homeplace of Bill Monroe. Tour info: (270) 274-3551. If you don&apos;t even know a clef from a capo or a fret from a fingerboard, can you learn to identify Bluegrass music when you hear it? Traditional Bluegrass music will feature acoustic guitar, mandolin, fiddle, upright bass and five-string banjo played in the three-finger picking style made popular by Earl Scruggs. As in Jazz, instruments are featured in turn with improvisational solos that show off the virtuosity of the player while the other instruments strum back up. The vocals are often close two or three-part harmony. Bluegrass singers are likely vocalizing at the upper reaches of their range, perhaps in part because Bill Monroe himself was a tenor. It is this intense and evocative vocal style so characteristic of the genre that is known as the "high lonesome sound." Make no mistake; musicians can, and do, argue long into the night about the exact differences between Bluegrass music and other styles such as mountain music, old tyme music, country, roots, Americana, grassroots, folk and progressive folk. But they all recognize its Kentucky origins. The seeds of Bluegrass have been carried far from Kentucky, and continue to take root and flourish in countries all over the world. Bluegrass Note: The "banjar", made from half a gourd and animal skins, originated in Africa hundreds of years ago. The five stringed banjo used in Bluegrass music developed from earlier four stringed banjos fashioned by African slaves in the 17th century. It&apos;s not certain how the short fifth string developed, but it was definitely in use by the early 1800s. When you are visiting Lexington, be sure to check out these venues for Bluegrass music. Southland Jamboree. Bring a lawn chair or blanket and make yourself at home for free outdoor Bluegrass music concerts every Thursday throughout the summer. Bring your instrument and join in the post-show jam session. The Southland Jamboree season starts in May and is held held at the Moondance Amphitheatre. Check their website for more information. www.southlandjamboree.org. Willie&apos;s Locally Known. This bar and restaurant on Southland Drive is serious about promoting Bluegrass music along with Americana, roots and country rock. Bands are booked every weekend, and often on week days as well. Check their website to see who is coming up on their schedule. www.willieslocallyknown.com. Concert Series. Every fall , the John Jacob Niles Center for American Music presents free noontime Friday concerts of Bluegrass music. All concerts are in the beautiful Niles Gallery of the Lucille C. Little Fine Arts Library, just off Rose Street at the University of Kentucky. (859) 257-4900. WoodSongs Old Time Radio Hour. Heard in more than 500 markets around the world, this radio show is taped live at the historic Lyric Theatre in downtown Lexington. Nationally known Bluegrass acts join a line up of traditional and folk music year round. The show starts at 7 pm on Mondays, but come early. The audience needs to be seated by 6:45. Admission is $10. See who is performing while you are in town at www.woodsongs.com. Akemon&apos;s Barber Shop. Do you play? Would you like to brag that you&apos;ve played Bluegrass in the Bluegrass? Join in a jam session at Akemon&apos;s Barber Shop in Paris, about 30 minutes north of downtown, on Tuesdays from 3 p.m. to around 6 p.m. If you don&apos;t play, you&apos;re still welcome to drop by and listen. Call first: (859) 987-3875. Windy Corner Market and Restaurant. With their emphasis on locally produced foods, it&apos;s no wonder that when there is music on the menu, it is likely to be Bluegrass. Call for the schedule. (859) 294-9338. Bluegrass Note: Every fall, the John Jacob Niles Center for American Music presents free noon time Friday concerts of Bluegrass music. All concerts are in the Niles Gallery of the Lucille C. Little Fine Arts Library just off Rose Street at the University of Kentucky. (859) 257-9000. 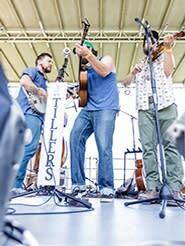 Naturally, great Bluegrass musicians continue to spring from the Bluegrass Region. Here&apos;s a partial list of local bands based in Lexington. Look them up and see where they are playing next. Custom Made Bluegrass plays original songs with a rural, Kentucky flavor shaped from the memories of real life characters. The band also loves performing traditional Bluegrass songs as well as "grassed up" country songs. If you love the sound of a dobro, this band will be of particular interest. www.custommadebluegrass.com. Blue Eagle Band features traditional Bluegrass, “Newgrass” and unique arrangements of traditional and original songs. Call to find out where they play next: (859) 296-5681. You’ll find the schedule for Cane Run Bluegrass at www.canerunbluegrass.wix.com/home. Cane Run plays the standards plus original compositions. They also maintain a Facebook page. Uptown Blue names Tony Rice, Rhonda Vincent and JD Crow as the artists that influence their sound. See what Carrie, Joe, Taylor and Terry have been up to on their facebook page or call (859) 492-8982. NewTown was started by Kati Penn, a talented fiddle player and vocalist from Frankfort, Kentucky. The musical heart of the band is Bluegrass music, but they journey into a broader realm of their own creation. They tour throughout the U.S. in addition to playing in Lexington. Learn more on their website: www.thenewtownband.com. Southland Drive is a four piece traditional Bluegrass and classic country band. Follow them on Facebook. (859) 276-3235. The Wooks deliver a fresh take on timeless bluegrass, as well as original material, that speaks to music lovers of all ages. Threads of rock, jam band and mountain music are woven together to create a sound that honors the sounds of traditional Bluegrass. Learn about their upcoming gigs on www.wookoutamerica.com. Bluegrass Note: Meadow Green Park Music Hall, in Clay City, Kentucky, was built exclusively for the preservation and performance of Bluegrass music. See national, regional and local acts. It&apos;s only a 45 minute drive west of downtown Lexington. Call (606) 663-8136.